Understand your businesses’ priorities following a power outage or disaster and make plans that address immediate, near-term and long-term needs and actions. Develop plans to ensure critical business processes can continue during a power outage or emergency. If you have equipment that cannot be disrupted even for short periods, such as a computer or sump pump, install a battery back-up system or generator. When using a generator, make sure it is properly installed by a licensed electrician, for the safety of lineworkers and other emergency responders who may come near power lines. Never use your generator in a basement, breezeway, and attached garage or near any fresh-air intakes, windows or doors to prevent deadly carbon monoxide from entering your home or business. Develop a communications plan for employees, customers and suppliers. Determine how you would serve your customers and coordinate with your employees and suppliers even if your facilities were closed or you cannot get to work. Have adequate emergency supplies on hand, such as battery powered flashlights, radios, extra batteries and first aid kits. Encourage your employees to be prepared at home. 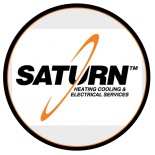 Saturn Heating Cooling & Electrical can help you determine the right generator to weatherproof your business during a storm. Contact us today!